Optimal settings for Ooma hub behind Dlink DIR-655? I have my Ooma hub behind my Dlink DIR-655 with the general QoS settings on. Just wanted to see if there were any other settings I should make to my Dlink DIR-655 router to get the best Ooma performance possible. Thanks! Re: Optimal settings for Ooma hub behind Dlink DIR-655? Besides QoS, I don't think there is anything else you need to do. Set the Ooma hub to a fixed IP address so it doesn't change. Set your outbound bandwidth to be at or lower than your actual outbound. Some people 90%-80% lower, but I think no more than 50kbps less than actual. So it depends how fast it is to start with. Thanks for the reply and direction to the other thread. One question I have is...will the Ooma IP address always be the same? I don't often reset my router, but IP address assignments are dynamic. Is there a chance that the IP address I assign today could change and then I'd have an issue? When I do speedtests, my upload speed is consistently between 3000-3900 kbps (Comcast cable internet). Do I really need to manually limit the uplink speed? QOS settings can depend on your network connections over the internet. They seem to differ from one person to another, but I would experiment and when you find something that works, leave it there. You may already have. Measuring my ooma on a call only uses 48k of bandwidth upload. I set my QOS to about 90% of my total upload and left it there. I have no problems at all with phone quality. As they say, Your Mileage May Very. I just did a few iterations and left myself VMs at work with calls from my home Ooma line. The settings below seem to be pretty good and have resulted in good calls without limiting my PC uplink speedtest results with this setting. stuman74 wrote: Thanks for the reply and direction to the other thread. Comcast cable does "Power Boost" which screws things up a bit. You'll get a temporary burst of 6+Mbps for the first so many MB of data then it will limit you to your paid service which should be 2Mbps. So if you did a long upload, you'd see it up about 4-6Mbps and then level off flat at 2Mbps and stay there. This tricks the speed test with this temporary burst and essentially makes the test inaccurate. When you manually set it to 2048 (2Mbps) this will tell QoS that if bandwidth use is at 2048, give all priority to Ooma and reduce all other traffic below 2048-Ooma's use. One negative side effect of this is that if you set it to 2048 and then run a speed test, while QoS is on you'll never see a test result faster than 2Mbps. The router is thinking you're exceeding your bandwidth and actually throttling the speed test. This is all to guarantee that Ooma will have something left over, and if Ooma starts using bandwidth it will of course prioritize Ooma and everything else will be lower. If you go to your network settings, you should see the DHCP licenses for all of the devices. You should be able to select Ooma from the list and save it as a reserved IP. That way whenever Ooma asks the router for an IP address it can always give the same IP address. That way it'll never change. I had a Linksys that would let you do QoS by MAC address so you didn't need to bother with fixing the IP address which was nice. but this works just as well. With this kind of outbound speed you almost don't need QoS. It's really important for people with 384kbps up on DSL or similar. If you didn't turn on QoS you'd only hear voice degradation if you really saturated bandwidth for a while with a big upload. So it depends on what you're doing. I've actually turned off QoS for now and had no problems. But if I get using heavy bandwidth at some point in the future I might have to turn it on to make sure Ooma doesn't suffer. The nice thing about having the Ooma in front of your router (between modem and router) is that Ooma's QoS only limits your bandwidth when you're actually on a call. Otherwise it lets everything through with no speed throttling. But that set up just doesn't work for me. I also have the router. I setup my local IP range at 192.168.0.187 (from and to) on the Dlink router. stuman74 wrote: One question I have is...will the Ooma IP address always be the same? I don't often reset my router, but IP address assignments are dynamic. Is there a chance that the IP address I assign today could change and then I'd have an issue? I believe most of the router out there does support static DHCP, that is assign a fix ip for each selected MAC address. My router (Airlink 101) does QoS base on ip address, so I have to set static ip for every box that needs it. I've had QOS disabled on my D-Link router (same model) and have had 0 problems with Ooma. 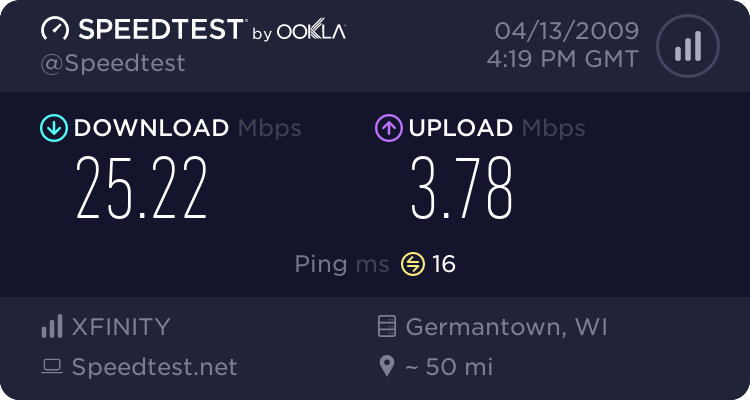 But I do have Comcast Cable modem with 3Mbps up, 16Mbps down officially (actually much higher) and no one in the house is doing intensive uploads like torrents. The reason I have it disabled is because I get upwards of 12+Mbps upload speeds on powerboost. That eventually drops to 3Mbps sustained upload rates if you deplete the powerboost which is super rare for me. If I turn on QoS, I'd have to set it to 3Mbps or less and I'd never see upload speeds over that setting. If I had to do something to guarantee reliable Ooma bandwidth, I'd turn it on.